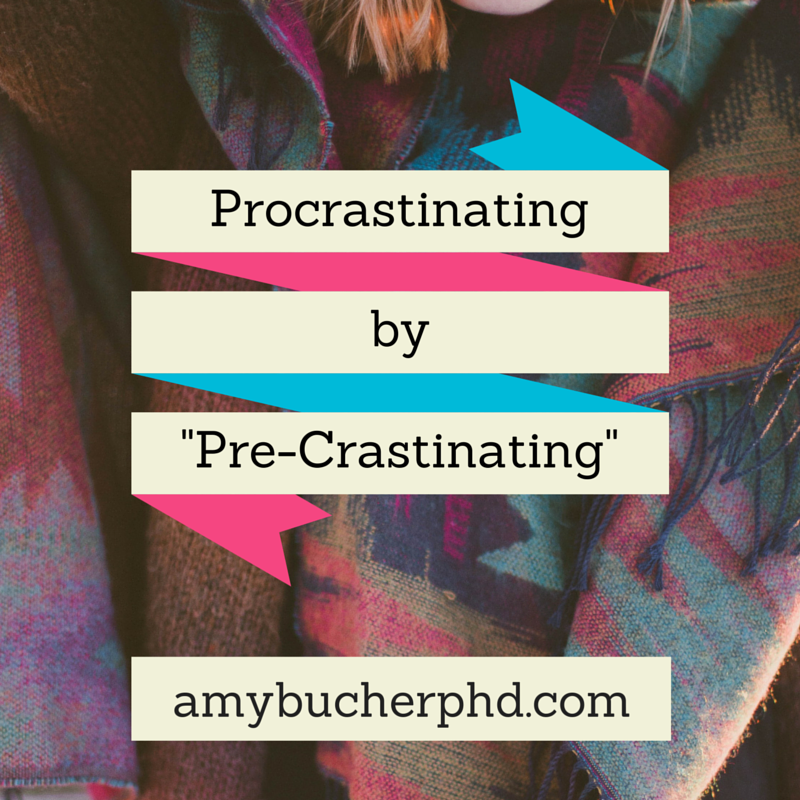 Procrastinating by "Pre-Crastinating" | Amy Bucher, Ph.D. In college, I’d say I was a procrastinator. I’ve always worked well under a deadline, and what better way to incite that energizing pressure than waiting until shortly before an assignment is due to begin working on it? Once I became a graduate student and then a professional, my workload became such that procrastination was no longer a viable option. The stakes were higher, and the tasks more complex. So, over time, I’ve shifted my work style to be more planful (although I still can crank out a mean last-minute job). Pre-crastination occurs when people tackle tasks early but unnecessarily. The researchers who originally observed the phenomenon saw that people were completing a bucket-moving task in a less than optimal way in order to get partially through the assignment more quickly. A more relatable example of pre-crastination, one I certainly observe in my own professional life, is paying attention to emails and other “housekeeping” type activities at the expense of focusing on more complicated projects. Confession: My inbox usually has fewer than 50 messages in it at any given time. This is not necessarily a good thing for productivity, as pretty much every anti-procrastination advice list makes clear. Ironically enough, while pre-crastination keeps people busy, it does not necessarily mean that they’re not procrastinating their major or difficult assignments–especially when so many of the tasks that are easy to knock off a list come to us through intrusive means, like emails, phone calls, and device alerts. Back in the days of the cavemen, pre-crastination may have helped people be productive, but in today’s wired world it appears to be a psychological crutch that simultaneously helps people feel productive while avoiding their less appealing work. Think about deadlines in terms of days instead of months or years. The smaller units of measurement (365 days vs. 1 year) help us to feel more connected to our future selves and make choices with the future in mind. This could include getting tough work done now so we don’t have to later. Dedicate the very immediate future to tackling something hard. For just the next three minutes only, do something that you’ve been avoiding. Often the pain caused by thinking about the dreaded task adds up to being worse than actually getting it done. Do you pre-crastinate? Procrastinate? How do you get focused on the work to be done?